Clarice Silber and Ana Radelat of www.CtMirror.org also wrote a news story today about the effects of the shutdown in Connecticut. 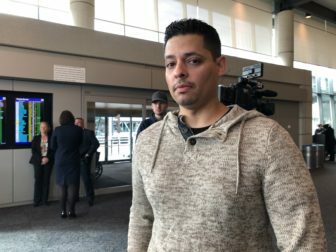 Adrian Pellot and his wife Sarah Small are among the roughly 150 Transportation Security Administration agents at Bradley International Airport who missed their first paycheck last week, and the couple’s concerns are mounting as the federal government shutdown rolls into a 24th day. Pellot, 36, who has worked as a behavior detection officer for more than 10 years, said he thinks about his missed paycheck almost constantly and feels frustrated that the government isn’t thinking about federal workers as people that have bills to pay. “Instead the government is holding us as a bargaining chip—so it’s agitating,” Pellot said. He and Small are now depending on their savings to pay their bills. Click here for more of their story. Click here for how to file for unemployment benefits.